The holiday season is the time of shopping & gift giving. Learn how to gift experiences — something far more gratifying than giving material items. It’s almost December and we are in that time of the year when the focus on gifts gets rather intense. At least for me, gifts equate to stress. The stress of shopping for the best deal, the stress of finding a place to hide that deal that you managed to find, and the added stress of trying to please even the hardest of recipients. STRESS! I’m not sure if that stress is felt by others. Sometimes I wonder if I am the only one who thinks like that. If anything, I just hope I’m not alone. I am crazy about gifting to friends and family – not just at Christmas but throughout the year, but instead of purchasing things I try to make homemade gifts like new baby blankets, fabric blocks … NFL cuddle blankets, even edible Christmas gifts that the recipient can enjoy. While I love giving.. receiving is a different story. While the mess of wrapping paper is something I can deal with, I’m not too hip on finding broken cheap plastic toys in our toy box for months after the holidays. Or listening to my kids kick a fit when I ask them to pick up their things. After seeing the hoopla that surrounds Black Friday I almost wonder if we, as Americans, are drowning in “stuff”. Too much stuff. Eventually those Christmas toys will, too, be a thing of the past. Most kids can’t and won’t remember what gifts they got last Christmas never mind 2-3 holidays ago. Thinking back to my childhood, my parents lived on a one-income modest homestead with 4 kids. We had our share of toys but nothing that required us to have a storage facility dedicated to storing things. We shared the few toys we did have, but most days we didn’t even want to be inside. We wanted to spray each other with the hose and look for lizards and salamanders under rocks and logs. Most of the time my mom couldn’t even get us to come in at night to eat dinner – the outdoors was our haven for fun. Every time I see a plastic kids pool at the department store I’m hit with memories of my brothers and I filling it up with over 40 lizards one summer. Only for them to dump them out one day and watch them scatter. The memories are still as fresh in my mind, 30 years later. Most of us know that we have too much stuff – many of us are tired of organizing, cleaning, and managing all that stuff. Our closets are full and our kitchens are in dire need of a sore clean out. I recently caught this post on Facebook from Becoming Minimalist and it came at such an opportune time. What Happens When we Gift Experiences over Things? We live in a nation that idolizes stuff. A joy through material goods, that success and happiness will come from the things that we own rather than the things we experience. Black Friday and the holiday shopping season is always a reminder of this every year. People wait for hours outside stores to get the next best deal on the television, video game console, the list could go on and on. In the end, these things don’t bring true happiness. Just a short term happiness that eventually wears off and leaves you looking for the next best deal. If anything, it makes you more tied down to a job that prevents you from spending time with your family all to pay for the things that you feel you need. Our life experiences bring joy and happiness, mistakes and achievements; in the end, they help us realize who we are as individuals. Life experiences define how we think and act, who we become friends and acquaintances with, and a better understanding of ourselves. We can’t quite sell our experiences.. but if we could, we would struggle to put a price tag on them. Our experiences tell us what we should and shouldn’t do again. Experiences come with nothing but life lessons. Thinking back to when I was a child, I don’t remember too many Christmas gifts I got – I do remember one of them though. I got a jewelry armoire when I was ten – and a Rainbow Brite when I was 5. Of all the Christmas holidays we celebrated as kids .. those are the only two material things I remember. I do, however, remember stuffing my face with too many thin mints every Christmas (ha – oh the memories. That was such a horrific day I won’t touch thin mints to this day!) I remember going on a million rides in the car with my brothers and sister to see Christmas lights, both planned and unplanned trips. I remember watching Sunday night football with my Dad and making snow forts in the ditch after a heavy snow. The things I remember weren’t exactly things.. but the experiences and time spent. Material things lose excitement over time. Experiences with others don’t decrease in value – they give us memories for years to come. 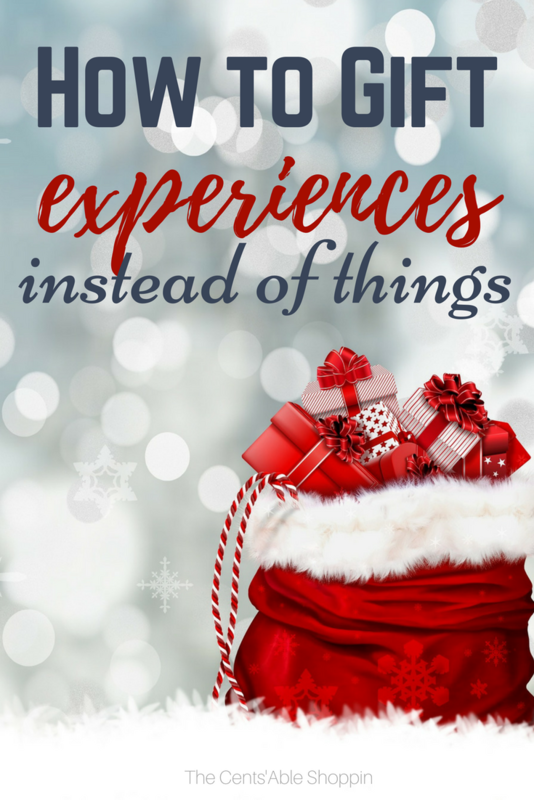 How do you Gift Experiences? It’s a transition – at least it took us a few years to adjust our children to not getting things but instead going somewhere. In our family we have chosen to gift experiences instead of material gifts and it has worked well over the years. I want to say this has been a choice we made at least 7 years ago. Of course, it’s a challenge when it comes to the extended family. But in our immediate household the kids look forward to doing a trip with us at the holidays – and they tend to remember these trips for years down the road. This is a great option for those that might not want to ditch gifts in their entirety. It’s still satisfying for children because they are still happy with a few things. But it’s not so extreme that it drains our pocketbook and has them picking up toys for weeks later. Something they want — This “want” typically ends up being something that they have been asking for .. that they really need to foster creativity. For our kids that means an art set with colors, a new LEGO creative box to allow them to build some more buildings for their LEGO city. Perhaps a sewing machine or gift card to Joann so that they can pick out their own fabric and sew a blanket, etc. It can be easy to go overboard if you aren’t careful, so establishing a limit on each child helps tremendously. Something they need — These “need” gifts are typically an experience that they have been wanting to see or do — sometimes, several of the kids want the same “experience” so we save up in advance. It’s rare that they all want something different. The last few years this experience gift was actually a trip to Bearizona in Northern Arizona and a night at a hotel with a pool. They agreed to agree on that and it was such a fun experience for us all. Something to wear — whew! We save quite a bit on clothing by purchasing secondhand and passing down from the oldest,. But these “wear” clothes usually include new socks, a swimsuit (hey – it’s Arizona) and sometimes new underwear. Something to read — it’s incredibly cost effective for us to visit our local library and check out new books without having to spend money and incur more clutter. But because I want to offer a new and different book as a gift to them, I’ll save up pictures of them and their siblings through the year. Then, I get them printed in a photo book. I like to personalize that book for each child. I usually have free Shutterfly codes through promotions, so paying shipping is the only expense. They love looking through the year in pictures, and the books get put up in their keepsake tub – if they get ruined, I can always get them reprinted. This is a book they can treasure as a keepsake and look back on memories later in life. How do you approach family and friends when you opt to gift experiences versus things? Though we have success in our immediate family, we knew that extended family may or may not wish to do the same. Our extended family wasn’t on board with gifting experiences over things – and that is OK. Because in the end, we can’t control what our extended family does. If anything, our relationship with them is incredibly important so we need to be okay with adapting with what fits in their budget and works for them. I’m grateful that my in laws gift my kids clothing that they need (socks, underwear). Those are things that they will use and wear and not discard for me to pick up 2-3 weeks after the holidays are over. But even if they did gift some off the wall things, we still try to teach them to be grateful for the thought. After all, that’s truly what counts at the end of the day – right?! Perhaps you need some ideas on gifting experiences over gifts – thankfully here are a mountain of ideas that you can incorporate into your family. These are just some of the ideas that we have incorporated into our family that have worked well and been enjoyed by our own kids. Local jump facility: I don’t know about your kids, but mine love to jump at all those indoor trampoline places. Several are included on the POGO pass (promo code CENTSABLE gets you 60% OFF).. but if you aren’t up for a pass, then inquire in your area to find out how much it would be to get an annual or monthly pass. Paintball: some of the older kids might love a pass to play paintball at a local paintball facility – it could very well be something the parents could do with them, too! Bowling: find a local bowling alley and inquire on the possibility of a monthly or annual pass that will encourage them to spend some time together being active. Memory keeper: kids love to collect things that they have acquired – for our kids, that’s rocks or pyrite (from panning for gold at the local ghost town)… fake money from the ghost town, and random oddities. Movie tickets: we don’t go to the movies all too often (it’s so expensive with 5).. but perhaps there is a movie coming up, the gift of tickets and a popcorn would be a wonderful gift. Overnight stay at a hotel: Kids LOVE staying in a hotel for a night – ours think it’s such a treat! Check out the rates for a city a few hours away and find a reason to make it an over-nighter. Ensure the hotel has an indoor pool and have fun. Gift certificate for a local restaurant: If your kids are like mine and don’t get to eat out much at all, a gift certificate to their favorite restaurant or for a pizza or two might be a wonderful option. Art basket: most kids love to do crafts of all kinds – ours could sit and play with glue and glitter for hours (mom cleaning it up of course!) Fill a bucket with art supplies and help them unleash a creative side. Lessons or classes: if you have kids that want to take up a new sport (karate, soccer, etc) then pay for a season of lessons for them. Horseback riding: This is one of the best experiences ours have had – several years ago, we invested in a Groupon deal for our kids and they go to go on a 2-hour horseback ride in our local area. They loved it.. and they still talk about it several years later. Drum set: Our older kids were infatuated with Twenty One Pilots (and still are) and Dad invested in a neat drum set to help them learn how to play. It has resulted in some really fun evenings (although I admit … some of those evenings were kind of loud). Kombucha brewing kit: if Dad or Mom have any interest in brewing their own, you can pick up a brewing kit on Amazon or from Cultures for Health. A brewing kit is not a necessity to brew your own, but it makes a nice gift if the recipient is starting with nothing. (then follow our tutorial on how to make kombucha for more). Outdoor experiences: this could be anything from a NASCAR race, to an experience in the pits… a local sports event that he has been eager and wanting to go to, to tickets to his or her favorite game. A day of sleep and rest: I don’t know about you, but I’d love to have a day to sleep in. With 5 kids, that’s a rarity. Dads as well – perhaps a day of “nothing” – where it’s just a lazy day that they can relax and bum around the house. A date night: this is a wonderful idea for a couple – finding a sitter can sometimes be a struggle for some couples. If you are husband or wife, arrange for that ahead of time so that you can enjoy a dinner or movie out together with more ease. Give the gift of a class: this could go for both men or women – something that that may intrigue them that they haven’t had an opportunity to accomplish. This could be a cooking class, sewing course, cake decorating, cooking, baking, yoga.. perhaps even gardening. Give a subscription service: there are so many unique subscription services out there. One that comes to my mind that is unique and always a hit is a 3, 6, or 12 month soap subscription for a custom, cold processed soap. This could be for a man or a woman! Give grandma and grandpa a day with the grandkids or family: take them for a lovely breakfast or dinner and out somewhere to a show, park, zoo or etc for them to spend time together. A beautiful photo of the kids: perhaps enlarged as a canvas, or just as an 8×10, or several smaller pictures scattered in a collage frame. A photo book: Title it “A Year in Pictures” and include pictures of all of the kids from the past 12 months. A hotel night: A one night stay at a really nice hotel where they can spend time together. Theater tickets – perhaps they would like the time together to watch a show – a local play or musical. Science Museum: Your local Science Museum usually offers memberships for a family of 4 or, more (you may have to inquire if you are a larger family as the rates are slightly more). Amazon Prime: I love Amazon Prime and as a parent of 5, I use it more than I want to admit! Some people can’t bring themselves to buy a membership, so give them the gift of Prime – either for 3 months or 12. A warehouse membership: I hate to suggest this as a family gift, but I know many families that aren’t up for buying a warehouse membership yet they need to. You could consider Costco, Sam’s Club, BJ’s Warehouse, or even Thrive Market as options. Sporting event tickets: If you are a fan of a local NBA, NFL, NHL or even MLB team, taking the kids to a game or two might be a wonderful experience for them. Most major metropolitan areas have a professional and college team that you could score tickets for. Local Zoo Membership: If you have a POGO pass, you can get 2 free admissions per person, per year with your pass. But if a POGO pass isn’t for you, then consider investing in a local Zoo membership for your family. Kids love to see the animals all year long, and if you are in a warm weather climate, it’s a fun family activity in cooler winter weather. Gym Membership: Perhaps your family is looking for a fun way to keep fit and have kids activities right at hand – the YMCA is a great option to invest in as a family. Look into purchasing a one year membership. They have activities for kids, swimming and open-gym to allow the kids time to release energy. Local Theater: a local theater has shows for kids and adults alike. Not only would it give you time to spend with your kids at plays they may enjoy, they may also offer shows that cater to you and your spouse. These may allow you a little time to get away throughout the year. National Parks Pass: these passes are non-transferable, but you could gift someone the cost of the pass and drive them to the office to fill out the forms and get their pass. Some people may qualify for a free pass, too (see here and here for more). Family Ski or Snowboard Pass: if your family loves to spend time in the snow, they may appreciate a yearly pass to a local ski resort so that they can ski or snowboard together. A huge family puzzle: your kids might love the challenge of putting together a huge family puzzle. Perhaps something that will encourage you to work together as a family. Puzzle Warehouse has so many fun ideas. When you are done, you can frame and hang. One of the best things you could gift as a family or even to grandparents is the opportunity to volunteer – find a local shelter or kitchen and serve your local community. Not only is that a learning experience, it’ll help your kids gain some understanding of what it’s like to give back to a community that does so much for them. What do you gift at the holidays? If you find yourself gifting material items at the holidays and looking to do something different, consider some of these suggestions above. The transition doesn’t have to be immediate – take your time to work into this choice gradually. Over time, your children and family will reap the reward of making memories instead of shopping for stuff. You might even find that the holidays are more enjoyable when you don’t have to worry about sales, long lines, traffic and in many cases, hiding gifts. You’ll find more time to spend with each other and make memories as a family. If you choose to continue to gift, try to shift the focus into creating something that will provide a lifelong memory. There are so many opportunities to gift experiences over material items, these are just a few of endless ideas that are available. Do you prefer to gift experiences over material gifts? If so, was the transition gradual or immediate? Is there anything that you would add to this list that would work for your family?